I am writing this on Sunday lunchtime to the soundtrack of vuvuzela's outside my window as Notting Hill Carnival kicks off. I am heading out later on today to get a sense of what it's all about after having watched all of Notting Hill get boarded up over the past couple of days. In all honesty I have been feeling super anxious about the whole thing as I have never been before and am living in the middle of it. So many people I know recommending getting out of Notting Hill for the duration of it as you don't get any peace, but I am staying put for at least today to see what it's all about! Anyway, more on that on Wednesday because I am heading out with my film camera to document it all too! For now, lets talk about this outfit. Weekday very kindly sent me a voucher a few weeks ago to spend in their shiny new store on Regent Street. 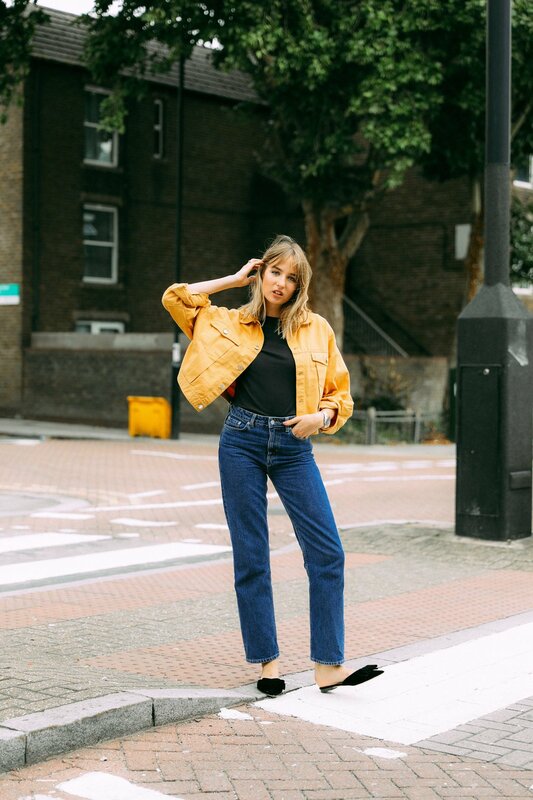 I have always loved the brand for denim, but due to the lack of the stores here have previously relied on what they have in stock on ASOS - which usually sells out in a flash too. Of course I picked up some denim, a pair I really love. These are the only pair of jeans I have found that remind of my straight leg 501s that are some of the best I own. They have the same wash and straight leg, bloody marvellous! I got a W26 L30, and they fit like a dream too. 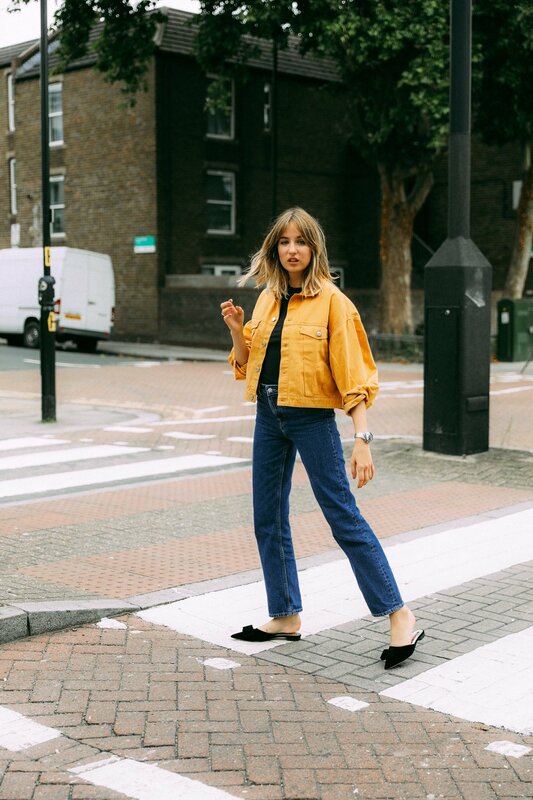 I also grabbed up a yellow denim jacket which is a great shape. 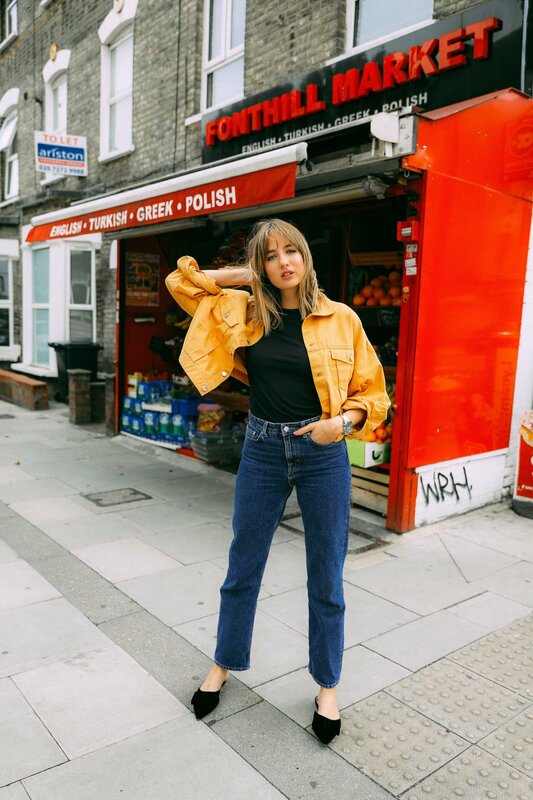 It's giving me some seriously 80s vibes, and while I bloody love these jeans I think this would look awesome with some black skinnies and these shoes. Definitely a look I am going to go for soon! These shoes have been firmly attached to my feet since I got them. I am obsessed!!! There is a Matches shop dangerously close to my house and I accidentally on purpose went for a browse and then accidentally on purpose bought these shoes. Thankfully, despite it all being one big accident, I don't regret it in the slightest as I love these bloody shoes.